Executing competent death metal with a definite Swedish spirit lurking in the guitar tone and familiarity in the riffs, Germany’s Wound have followed up their acclaimed Confess to Filth demo with this debut full-length, Inhale the Void. Production and songwriting is everything when dealing with death metal of this caliber and since Wound doesn’t have a deep history to appeal to fans of the genres nostalgic tendencies, they have a difficult job ahead of them trying to break into a bloated musical realm, especially while reanimating the same riffs that have been on display for decades. Inhale the Void is a solid album, with the songs centering around a mid-paced or “old-school” if you will tempo and power chord dominant riffs that introduce a meaty groove before decaying into tremolo melodies. A mid-ranged Mille meets insert random death metal vocalist HERE styled screamer leads the charge, effectively empowering the weighty foundation with vocal rhythms that thankfully avoid the obvious path (ie: following the movement in the riffs with syllables falling on every beat). It’s really good. Catchy even. So what’s the problem? 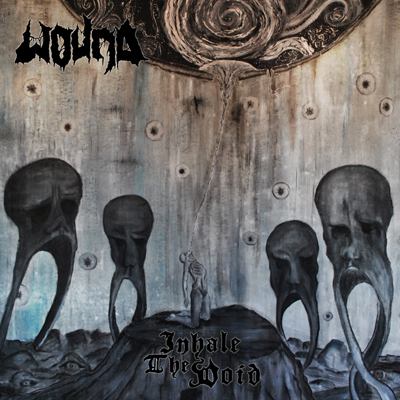 There really isn’t a lot of individuality on display here, or musical twists with enough suspense or hooks to make me forget about Dismember, Entombed, Hail of Bullets, Bolt Thrower, Asphyx, or whatever other bands stylistic influence that does creep up in Wound’s music. This entry was posted on July 31, 2013 at 6:08 pm and is filed under ALL REVIEWS, W-reviews.You can follow any responses to this entry through the RSS 2.0 feed.You can leave a response, or trackback from your own site.